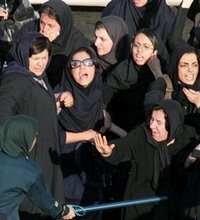 After beating women senseless in the streets of Tehran, Iran announced the following day that they will publish a report condemning the West on Human Rights violations. Iran will follow in the footsteps of Human Rights Watch and Amnesty International and release a report on human rights violations in the US and European Union. This was announced within 24 hours after severely beating, tear-gassing and arresting dozens of Women’s Rights protesters in downtown Tehran on Monday, June 12th.